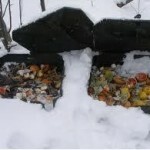 Will the food attract animals?There is no reason to cover the food scraps with leaves in the dead of winter because they will freeze very quickly and create little if any odour to attract animals. With smaller store-bought bins keep the lid on tightly and once the warmer weather arrives you can cover the food waste with some leaves or other brown materials. If you have a larger compost pile in your yard, save a few bags of leaves from your fall raking to cover food periodically throughout the winter or in the spring when things start to thaw. I don’t like walking to the bin, what are my options?. If you have a small store-bought bin, you can place it in a convenient place close to the house so you don’t have to trudge through the snow to get to it. You can also consider using a 5 gallon pail or similar container to store your food scraps and make your trips to the compost when it is full. 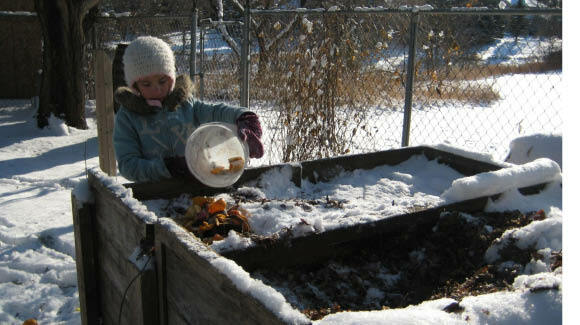 This way you can even pick a milder day to empty the compost. Keep the container in your garage or similar cold space with a lid on it and make far fewer trips to the compost pile in the cold. What if my compost bin fills up? If you harvest in the fall or if you have a larger compost pile, it is not likely that you will have this problem. With the colder temperatures, everything that you add will freeze so there is no reason to add extra leaves or browns, which can can fill your bin quickly. If it does fill up, you can always store compostable items in a separate container (pail or garbage can) and place the contents in the bin once things start to thaw in the spring. 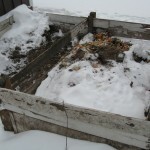 Composting in winter is not really different than composting in the summer, it is just slower. Keep composting all year round to maximize your free soil amendment and at the same time minimize your impact on the environment. Drop us an email at compost@greenactioncentre.ca . Check out our composting FAQ page.